Dads “invest” in their children. An interesting choice of words, don’t you think? Actually, it’s not that interesting. The involvement of dads has been most often linked, historically speaking, to how well they provide financially for, or invest in, their children and family. Fortunately, a social norm has started to form that values a more holistic notion of what it means for dads to invest in their children. While dads still invest financially, they also invest emotionally, intellectually, and spiritually. And this message has gotten through to today’s dads. The fatherhood role is central to dads’ identity, which has led to, among other things, dads spending more time than ever in child care activities. Most studies on dads’ involvement in their children’s lives have examined the level at which dads invest financially and, to measure more holistic involvement, their time in raising their children. The researchers interviewed dads about the time they invested in 33 father-child activities, the status and quality of their relationship with their child’s mom, and their beliefs around being a financial provider. They found that a dad’s resources, relationships, and parenting beliefs affect how much he invests. Read NYU’s summary of the study results for more details on how the researchers defined each of these factors and how much the factors affect a dad’s investment. what a man values generally and in his role as a dad specifically. In the 24/7 Dad® A.M. and P.M. programs, for example, dads learn to break down the myth that it’s a sign of healthy masculinity to bury and not express emotions. After breaking down that myth, dads learn to value expressing emotions and how to do so in appropriate ways that don’t harm them or others. The bottom line is that to help dads understand and embrace a holistic notion of investing in their children, you must approach your work with them from a holistic perspective: build pro-fathering knowledge, skills, beliefs, attitudes, and values. 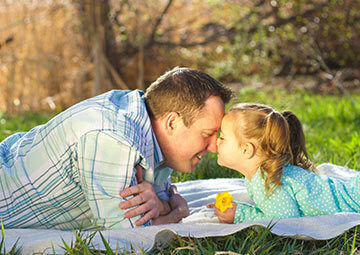 How do you help dads understand and embrace a holistic notion of what it means to invest in their children? Have you taken advantage of all NFI offers to help you address dads’ investment from a holistic perspective?